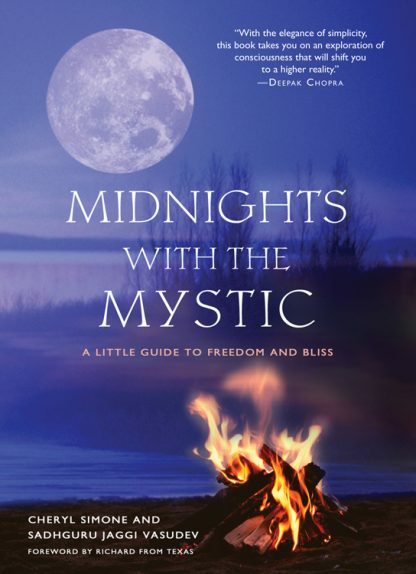 Constructed around a series of late night conversations around a camp fire between Cheryl Simone and Sadhguru Vasudev on an Island in the middle of a Western North Carolina lake near her mountain home, Midnights with the Mystic is the most thorough exposition of the teachings of India's most sought after mystic. Sadhguru challenges us to embrace the possibility that to each of us is available a higher realm of reality, a peak of consciousness; an entr�e into the realm of freedom and bliss. Simone, an Atlanta real estate developer, was the typical baby boomer in search of an authentic spiritual experience. Professionally successful, yet spiritually arid, she discovered a way into what she was looking for in the teachings of Sadhguru. Concrete and down-to-earth, Midnights with the Mystic both provides readers with an introduction to profound spiritual teaching and a personal glimpse of a charismatic guru. Cheryl Simone, an Atlanta real estate developer, was the typical baby boomer in search of an authentic spiritual experience. Professionally successful, yet spiritually arid, she discovered a way into what she was looking for in the teachings of Sadhguru. Sadhguru Jaggi Vasudev is an "enlightened" teacher based in southern India. He was named one of the most influential figures of the 21st century by The Times of India. He frequently speaks at international business and NGO gatherings, including the United Nations and Microsoft conferences.